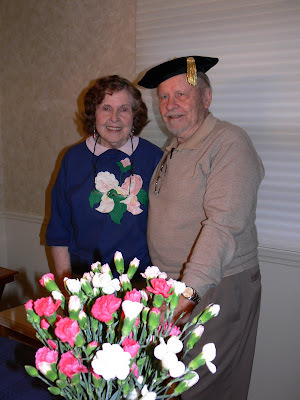 Retired Grace Brethren pastor and longtime Brethren Missionary Herald Co. board member Russ Ogden (shown here with his wife, Betty — Joan Snively photo) has completed his Ph.D. degree. Russ, who lives near Indianapolis, Indiana, says, “I have finally met the requirements for the degree of Doctor of Philosophy in Religious Studies with emphasis in Philosophy and History. It will be awarded by Trinity Theological Seminary in Newburgh, Indiana, and endorsed by Canterbury Christ Church University in the U.K. The graduation ceremony will be on the campus of Trinity in Newburgh, August 2, 2008. BMH: How long have you been working on the degree? RO: I began in April, 2002, and finished in March, 2008. It took about 2½ years to finish the required courses, but 3½ years to finish the dissertation. The seminary during that time made changes in its doctoral program. It took about a year for me to settle on my subject and to determine how it would be developed. The subject of my dissertation was an analysis of microbiologist Michael Behe’s concept of Irreducible Complexity as presented in his book, Darwin’s Black Box (1998) and extended in his second book, The Edge of Darwinism (2007). The subject is foundational to the argument for Intelligent Design, the evidence of an intelligent Designer as the source of the universe and life rather than the Darwinian argument of adaptation and Natural Selection with no intelligent guidance, purpose, or meaning. Behe demonstrates that microbiological cells, which were like a mysterious “black box” to Darwin, are actually microscopic machines beyond the complexity and efficiency of any machine ever designed by mankind. My task was to see whether his concept is able to stand up before his naturalist critics. I think my paper demonstrates that it is eminently able. Intelligent Design is true science; it explains life as we find it, whereas Darwinian evolution does not. BMH: Why did you want to do this? RO: I have been working many years on the theme of God’s sovereign delegation of freedom to mankind and our responsibility in the use of that freedom. I believe the Bible indicates that not all destinies are “predestined” by God; we determine our destinies by the way we respond to God. Obviously, the subject is controversial – even more so than Darwinism. One Christian publisher told me it should be published, but it’s too controversial for their supporters. Another said it was too long for popular reading and should be published as a textbook. I was not qualified to write a textbook. I concluded that to get a publisher to look seriously at my manuscript I would need a Ph.D. God was good to me; I now have it. BMH: How old are you? RO: I began my Trinity course at age 77. I have completed it at age 83. I’m really living my career backward. I should have gone after this degree fifty years ago. BMH: What sacrifices had to be made in order to earn this degree? RO: Well, I have had no salary since I retired from the pastorate fifteen years ago. My wife taught school for about ten of those years. Our last church, Lanham, MD, pays our medical insurance and we live frugally on Social Security and interest from investments. Still, we own our home, have no debts and have never lacked food, clothing, or anything else we need. We have had to economize on travel. Time-wise, my wife has sacrificed more than I have. She does a lot of knitting and phoning while I am studying books and punching computer keys. BMH: What kinds of comments/feedback have you had from friends, parishioners and colleagues as you have pursued the degree? RO: All comments have been encouraging. My church, Lanham GBC, MD, even granted me a year of sabbatical leave at half salary for research on the “Freedom” book. Friends ask, “How is the book coming?” They say they want to read it. This is not yet possible, but may become so in the next year, God willing! We’ll see what opportunities develop. BMH: Are you looking for a job now? Perhaps as a professor? RO: Definitely not! I shall pursue publication of a condensed version of my dissertation, try again with my book on Freedom, reprint my Capsule View of the Bible and add a Spanish edition translated by a missionary friend. A Portuguese translation has been used in Brazil for many years. BMH: What does Betty say about all this? RO: Betty has been my chief supporter through this entire adventure. I dedicated the dissertation to her. As a retired English teacher, she has proofread all of my manuscripts. Nevertheless, she will be happy to do something else now – like visiting grandkids. BMH: Background–what other degrees do you have, and where have you pastored? What other leadership roles? To God be the Glory! Great things He has done! in Lanham Maryland From 1977-1982. My name is Donald Bolig and I was enrolled in the flight training program at Bob Jones University from Sept 1948 to Dec 1948. I was on the internet tonight and typed in your name to see what would come up. Imagine my suprise when I read about you on BMH editor's blog. I think the other instructor's name was Curt Wetzel. I soloed in their Piper PA 11 N78768.I I was really glad to hear about your life and about your Ph.D.If you go on the internet to quakertownbfc.org, you will see some of the web pages that I helped design.